If someone asks a CEO of an organization why to develop a strategic plan, the response will likely be: “A strategic plan helps decision makers determine where to spend time, human resources, and money to facilitate the goal achievement.” But what does ‘strategic’ really mean for a company? According to Wikipedia, strategy is a high level plan to achieve one or more goals under conditions of uncertainty. It is a series of unique decisions stemming from some kind of analysis that will help you to get to a particular goal from a starting point. Build your road to success with Roadmap Planner! This is the first and very important stage in the planning process. As CEO, you are the one to state the company’s mission, which is its business vision. This includes company values, its purpose and forward-looking goals that guide the pursuit of future opportunities. Guided by the business vision, you together with the board of directors can define measurable objectives such as sales targets, earnings growth, the company’s business position, market share, and organization’s reputation. At this stage the company’s strength, weaknesses and opportunities are to be identified. With the help of analytical tools, like PEST analysis, Porters 5 forces, SWOT analysis, Growth-share matrix, Scenario Planning, etc., you’ll need to perform an industry analysis and find out where your competitors are, evaluate entry barriers and customers. This one is usually the most complicated step. You are to develop several different strategic options that might be available to the organization according to your analysis. It is very time consuming and involves participation of all C-level managers or the board of directors. One of the common planning mistakes of this process is that options are often not brought to the table because somebody believes they won’t work. You should convince the leadership team to articulate the ideas and the logic behind a particular strategic option rather than moving directly into an evaluation stage. You should be able to describe in one or two pages what is the strategic intent, where in the value chain you propose to play, what choice of products or services should be sold at what prices, and where to sell them in order to maximize value for the organization. Before you start developing a roadmap, you or someone in charge will have to conduct a serious financial analysis, along with tools for sensitive analysis and scenario planning. You will have to spend some time with your team to differentiate between various decisions, scenarios and options. When the strategic options have been elaborated, you can put together the plan for approval of decision makers. Though it might be not the final one and may involve a couple of rounds of iteration before it is finalized. This plan will be your roadmap for where the organization aspires to be in a couple of years. Don’t consider your plan as a “to-do” list with loads of activities and timelines and individual names, who are responsible for various activities. First, you need to have an agreed upon plan. 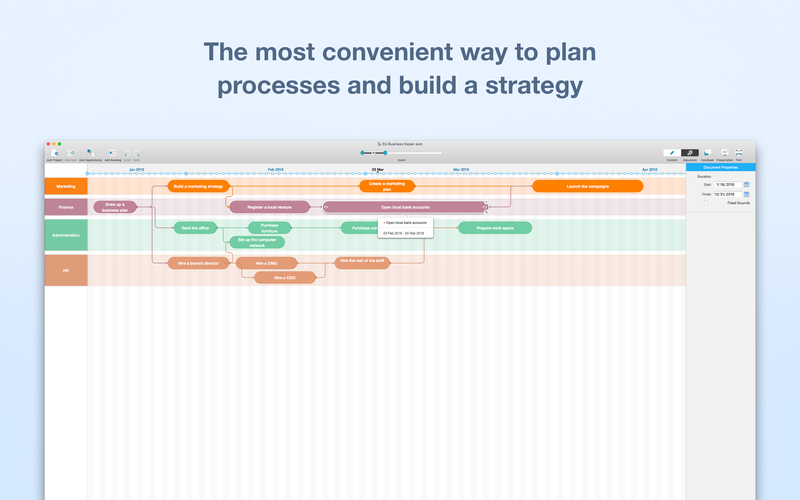 This is what Roadmap Planner can help you with. 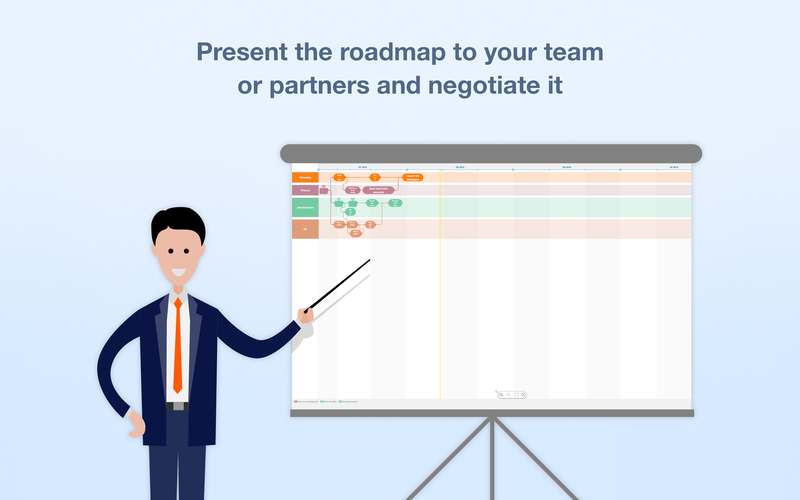 Roadmap Planner is a strategic communication tool that lets you create a plan in a few quick steps and show it off to your team, board of directors and stakeholders. Implementation of the chosen strategy involves organizing the company’s resources and staff motivation in order to achieve objectives. The way in which it is implemented and executed will guarantee its success or failure. Oftentimes, those who implement the strategy in the organization are not the same people who build it. You must take special care to communicate the strategy and the reasoning behind it to your employees. Otherwise, the strategy might be misunderstood or lower-level managers will resist its implementation because they do not understand why the particular strategy was selected. It’s not over. It’s never over. To ensure your strategic plan performs as designed, you must regularly review and evaluate the process. Refine it as necessary, and make changes if something doesn’t go as intended. The implementation of this guide on how to create a strategic planning roadmap for your organization might not seem as an easy task. And it really isn’t. But if you follow these steps, you will finally lead your business to success. Putting together a strategic roadmap plan will optimize your business processes, improve your workflow, and help you to achieve your goals.